Sir Richard Branson was born in 1950, and educated at Stowe School, where he established a national magazine called Student at the age of sixteen. He started a Student Advisory Centre aged 17 to help young people. In 1970 he founded Virgin as a mail order record retailer and shortly thereafter opened a record shop in Oxford Street, London. During 1972 a recording studio was built in Oxfordshire where the first Virgin artist, Mike Oldfield, recorded “Tubular Bells” which was released in 1973. The first album of the newly created Virgin Records went on to sell over 5 million copies. The equity of Virgin Music Group – record labels, music publishing, and recording studios was sold to THORN EMI in 1992 in a US$1Bn deal. Today, Virgin is one of the world’s most recognized and respected brands. Virgin Group has expanded into international retail, air travel, mobile, financial, retail, music, rail, resorts and leisure, space travel, and clean fuels through more than 200 companies’ worldwide, employing approximately 50,000 people in 29 countries. Revenues around the world in 2006 exceeded £5 billion (US$10 billion). Virgin Atlantic Airways, formed in 1984, is now the second largest British long haul international airline and operates a fleet of Boeing 747 and Airbus A340 aircraft. The airline is founded on the concept of offering a competitive and high quality Upper Class, Premium Economy and Economy service. Virgin Atlantic are about to make history again. Early in the New Year 2008, we’ll become the first commercial airline to fly a 747 on biofuel as we demonstrate it in flight. During 1997 Virgin took over Britain’s two most run-down rail franchises, CrossCountry and the West Coast Main Line. Virgin is currently engaged in a £2 billion fleet replacement programme to create one of the most modern rail networks in the world by the end of 2004. Since 1985, Richard has been involved in a number of world record breaking attempts. In 1986 his boat, “Virgin Atlantic Challenger II” rekindled the spirit of the Blue Riband by crossing the Atlantic Ocean in the fastest ever recorded time. This was followed a year later by the epic hot air balloon crossing of the same ocean in “Virgin Atlantic Flyer” which was not only the first hot-air balloon to cross the Atlantic but was the largest ever flown at 2.3 million cubic feet capacity and reached speeds in excess of 130 miles per hour (209 k/ph). In January 1991, he crossed the Pacific Ocean from Japan to Arctic Canada, the furthest distance of 6,700 miles again breaking all existing records with speeds of up to 245 miles -per hour, in a balloon of 2.6 million cubic feet. Between 1995 and 1998 Richard Branson, Per Lindstrand and Steve Fossett (who joined the team after the sad death of Alex Ritchie), made a number of attempts to circumnavigate the globe by balloon. In late 1998 they made a record breaking flight from Morocco to Hawaii but their dream of a global flight was shattered by bad weather before a Swiss team successfully circumnavigated the globe in early 1999. In 2004 Richard’s dream of opening the world’s first ever commercial Space Tourism business was realised with the launch of Virgin Galactic. Based on the proven technology of Burt Rutan’s SpaceShipOne Virgin Galactic’s SpaceShipTwo, the VSS ENTERPRISE will take its first customers to the stars. A child of the moon landing Richard has dreamed, as have many millions across the world, that the experience of Space should be opened to all as Virgin Galactic grows this dream will finally become a reality. To find out more on the birth of this historic aviation industry please log on to: www.virgingalactic.com. 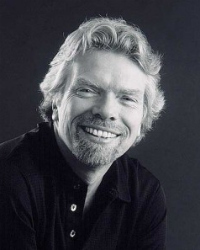 In September 2006, Richard announced at the Clinton Global Initiative that all future proceeds of Virgin Group’s transportation companies will be invested into renewable energy initiatives. Richard believes that all businesses, especially those involved in transportation, energy and particularly fossil fuels such as coal, must be at the forefront of developing environmentally friendly business strategies with a focus on replacing traditional energy with energy coming from renewable sources. This commitment is estimated to be $3 billion over the next ten years. In February 2007, Richard announced a $25 million prize to encourage a viable technology which will result in the net removal of anthropogenic, atmospheric greenhouse gases. In July, on his and Nelson Mandela’s birthday, Richard joined Nelson Mandela, Graça Machel, and Desmond Tutu to help announce the formation of the Elders, a group of leaders to contribute their wisdom, independent leadership and integrity to tackle some of the world’s toughest problems. Richard is also putting significant focus into Virgin Unite, the independent arm of the Virgin Group that focused on entrepreneurial approaches to social and environmental issues. He is supporting a number of efforts with on the ground partners ranging from the creation of sustainable health clinics in Africa to the fostering of new entrepreneurs through the Branson School of Entrepreneurship in South Africa. He is also setting up a “War Room” in Africa to help coordinate all the different health efforts, look at and advise on best practices, and monitor and alert the world to new diseases. Check out more about Unite at www.virginunite.com. In December 1999 Richard Branson was awarded a knighthood in the Queen’s millennium New Years honours list for “services to entrepreneurship”.